Well seems like Christmas has hit the Play Store. Google has released a fun little app for the little ones this Christmas. 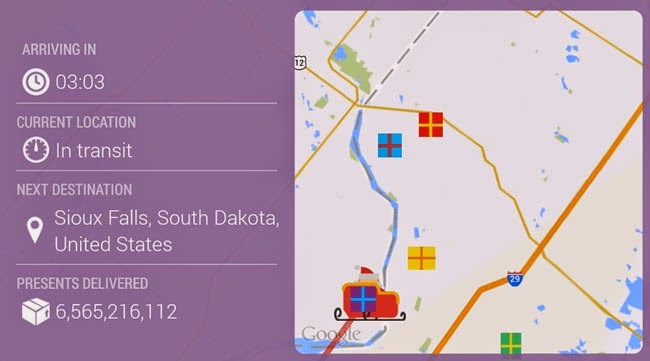 The app is titled Google Santa Tracker and it is quite interesting. This app is a fun little app which comes bundled with some mini games as well as a neat little Santa Tracker based on Google Maps. This app shows the location of Santa around the world. His location is shown in a Google Map layout. If you do not know him, he is the one in a sleigh, carrying and distributing gifts to children around the world. He goes "Ho Ho Ho" every once in a while. The main theme of this app seems to light up Christmas spirit for the young ones. You will hear some nice bells jingling and see the gifts being distributed. You will also see details like where in the world Santa is currently, how many presents have been delivered and what his next destination is. Gumball: In this, you will have to make those Gumball roll down to reach the bottom of your device's screen. Level up and you get more gumballs and a tough puzzle like layout to go through. Memory: Remember those images and match them up with their pair. Tap on the screen on those doors to do so. Elf Jackpack: Help an Elf who has been strapped on a Jetpack to collect gifts and candy. You are the one controlling his flight.